Flat meshes allow the surgeon to customise the prosthesis, cutting and shaping it to suit the size of the hernia and the area to be reinforced, so providing maximum versatility and flexibility. 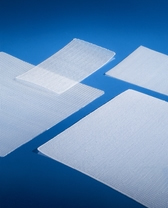 The various types of mesh available are the result of combination of different wefts, thicknesses and grammage; they are all macroporous, and can be used to treat both inguinal and abdominal hernias (umbilical, epigastric, lumbar and ventral hernias), allowing a wide choice of mesh and surgical technique. Hermesh 8 is a quadriaxial woven light mesh1. Its 16x40 cm size is especially recommended for preventing incisional hernias in high-risk patients when undergoing laparotomy for liver or kidney transplant.